An MQ-9 Reaper Drone is seen in an undated file photo. Click to see other uncrewed aerial vehicles that are known to carry weapons or that might be adapted to carry them. An unarmed Air National Guard drone crashed into Lake Ontario during a training exercise Tuesday, the military said. The MQ-9 Reaper took off from Wheeler Sack Army Airfield at Fort Drum, N.Y., as part of a mission training pilots for the Air Force, Air National Guard Col. Greg Semmel said at a news conference Tuesday evening. The crash occurred about 1 p.m. local time in eastern Lake Ontario about 20 miles northeast of Oswego, N.Y., he said. The drone was attached to the New York Air National Guard’s 174th Fighter Wing – the first fighter squadron to be converted from piloted F-16s to an all-drone force. Semmel, commander of the 174th, said the cause of the crash was unclear and would be investigated by the Air Force. “The mission was going as advertised, as briefed, up to the point that we did lose control of the aircraft," he said. He said that the weather was “good enough to fly” but that he did not know details of the conditions when the drone crashed. But Semmel said that a search for the aircraft had been called off Saturday evening because of bad weather in the area. He said the Coast Guard would use a 47-foot vessel out of Oswego, N.Y., and a helicopter out of Buffalo to search for wreckage when conditions permitted. The New York Air National Guard briefs the media after an MQ-9 drone crashed into Lake Ontario. He said all flying activities of the 174th had been suspended during the investigation. 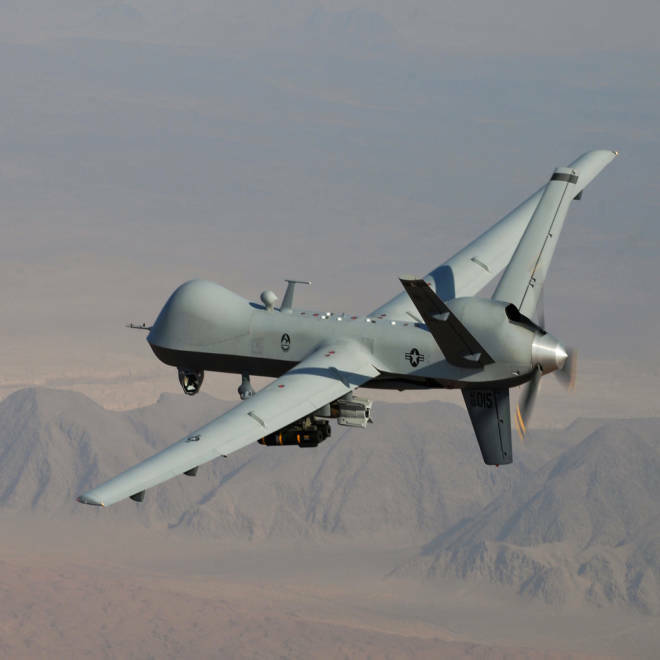 The Reaper is one of the U.S. military’s mainstays for surveillance and remote attacks in Afghanistan, Pakistan and elsewhere. Reapers have been stationed in the Horn of Africa and the Seychelle islands, first to monitor piracy off East Africa but later to launch attacks on al Qaeda targets in Somalia and elsewhere. A number of NATO countries are flying Reapers or have ordered them. The Reaper is larger than the well-known Predator, with a 66-foot wingspan and the ability to carry a payload of electronics and weapons of 3,800 pounds. It can cruise at 230 mph with a range of about 1,150 miles and a ceiling of 50,000 feet. Semmel said the cost of a Reaper is $4 million to $5 million. The federal government has pegged the cost of a four-plane Reaper package at about $57 million, including the necessary ground station and satellite uplink. There have been numerous previous crashes of Reaper drones. Drones are expected to see much wider civilian use in the United States when the first federal permits are issued, which is expected in 2015, and regulators are keenly examining such crashes as they develop safety guidelines. The international market for drones is also expanding. Semmel said four Reapers are used “on a regular basis” for student pilot training out of Fort Drum. He said a student pilot was at the controls when the aircraft was lost.